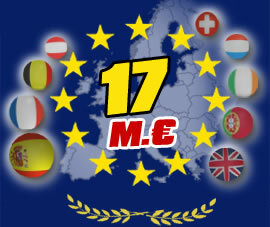 Euromillones.com is the website with all the information about Euromillions® (Euromillones in spanish), the game organized by nine european countries where you can always win millions in prizes. Here you can find the results and winners of every draw, stats about numbers and stars, data about jackpots, and all the information about the draw. You can also play with us if you wish to, from any place, in our shop. Reports on the numbers and stars, how many appearances, when was the last appearance, or how many times per year. Prepare the numbers for your next euromillions jackpot with the help of statistics. Frequently asked questions about Euromillions. How to play, when are the draws, who organizes the game, how much con be the jackpot, which is the prizes distribution, history and much more.